My thanks to the folks at onlineuniversities.com for this list of 20 Excellent TED Talks for Small Business Owners. 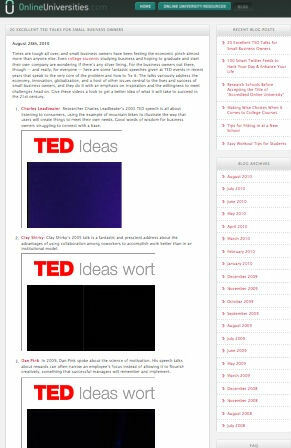 I’m a believer in the TED talks as the best of the best, and this is a good list. And my thanks as well to Steve King of SmallBizLabs for pointing it out in his post last Friday. There are several there that I’ve posted about or mentioned before in my own blogging, and one that I disagreed with, but so what: I disagree with a lot of smart opinions. Certainly it’s an excellent resource. It makes me think of how valuable this list might be for all of those people who are already or want to be business owners. I’m adding it to my list of recommended resources for my online curriculum in starting and growing a business.